After many years of celebrating Christmas together, last year Regan and I decided it was time to make stockings for our little family. 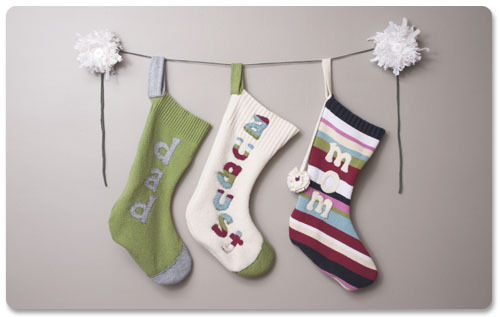 Some friends of ours saw those stockings and mentioned they might like something for their growing family. Nearly a year later, I finally got around to making that happen. These are made from old sweaters procured from Goodwill where I wasn’t alone in the search for the perfect pile of wool and cotton to reuse. As I filled with my arms with potential stocking fabric, I heard a “pssst” over the rack. A woman whose arms were also filled asked if I was seeking sweaters for crafts as well. After a brief crafting conversation, she then offered me the fluffy cream-colored wool sweater which I ended up using for August. Lately I’ve been making lots of friends in public. I’m a big fan of the friendliness permeating the air. Each stocking is made from the body of a sweater, using the ribbed bottom of the sweater as the top cuff of the stocking. I sketched each letter, cut them out and hand stitched each one to the stocking with a contrasting color of thread using an overcast stitch. I made the hanging loops from sweater scraps and reinforced the fabric with lines of stitching on the sewing machine so they don’t stretch out with time. After a bit of trial and error, I learned that instead of attaching the loops to the inside of the stockings, I needed to attach them to the outside of the stockings. And rather than attach them by stitching vertically along the seam of the stocking, I stabilized them with a substantial row of horizontal stitching very near the top of the stocking. At first the stockings hung oddly, the top of the cuffs turning inside out, until I realized that stitching the loops vertically to the inside of the stockings was making them flip inside out at the top. They are sweet, simple stockings that I hope will last for years. However, as with any project I make, I doubt the indestructible quality of them. Sadly the wool sweater selection was lacking at Goodwill and so I could only find a cotton sweater to use for the lettering on the “august” stocking. Throwing all that I know of fabric out simply so I could achieve the look I wanted, I used the cotton sweater regardless of the complications I knew I’d encounter. For anyone unfamiliar with the behavior of fabric, chunky cotton sweaters will unravel where wool sweaters can felt together creating a tight fabric that won’t unravel. I knew all this, but still really wanted striped letters for August. Therefore I used clear nail polish on the back and edges of each letter in his name in order to prevent any unraveling as the years go by. I was then careful to hand stitch over any sections that looked as though it still might threaten to unravel. Perhaps I should have just found a different sweater to use for these letters, but I suppose if the stockings are hung with care each year, they might stand the test of time.